How does it feel to take a weekend getaway when you have been following the same tedious routine? Good, doesn’t it? Well, I was ecstatic. 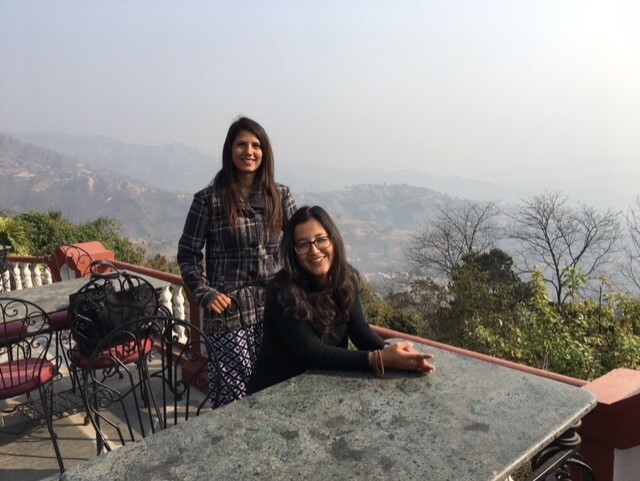 I was looking forward to the day when I, along with another Bo M. Karlsson Foundation scholar, Mandira didi, was going to accompany Sonnia auntie and Shannan—who at the time were visiting Nepal to meet all of us—in Dhulikhel, a hill town situated 30 km southwest of Kathmandu. 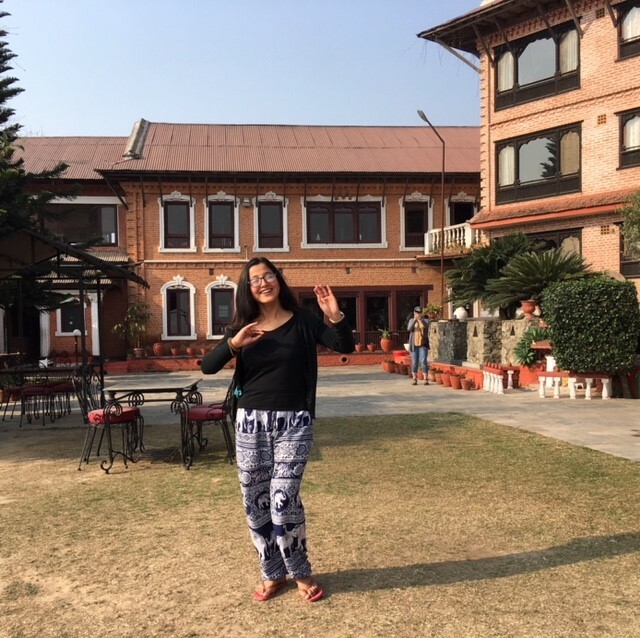 On Friday, 10 March 2018, Sonnia auntie, Shannan and I enjoyed a full day visiting Bhaktapur with our BMKF family. The whole day had been filled with lots of laughter, fun and photo sessions. When the time came to part, none of us were ready to let go. Farewells are always hard. But as the Bhaktapur day ended, our time in Dhulikhel was only about to begin. 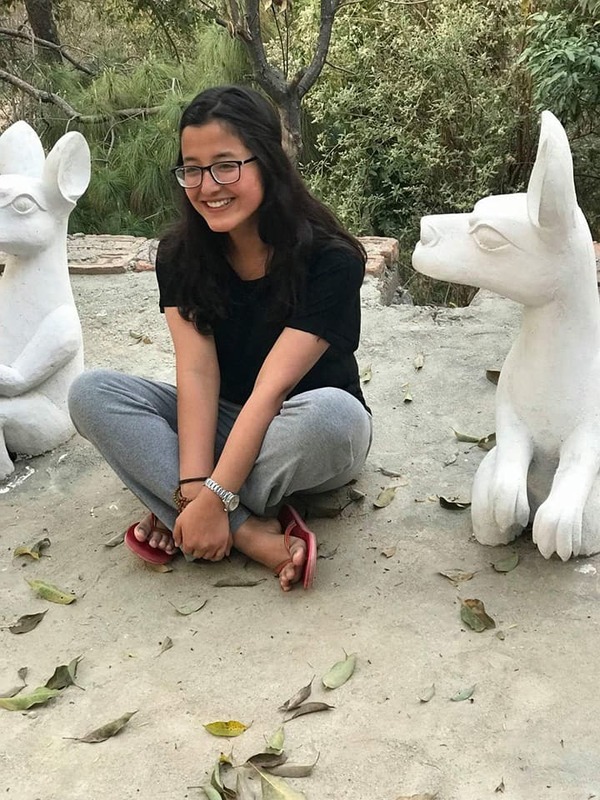 As the three of us were escorted to Dhulikhel by our driver dai, I enjoyed the twists and turns of roads singing along with Sonnia auntie oblivious to the fact the bumpy roads and heavy traffic were making Shannan very agitated (we learned that later). It was almost evening when we reached the Himalayan Horizon Hotel in Dhulikhel. Nothing could have prepared me for the sight that welcomed us. The hotel was beautiful, but it was the serene environment and varieties of flowers that enthralled me. They had all kinds of them! Being the impatient person that I am, I immediately went exploring, running everywhere like a kid. As the sun was about to set, I was spellbound by the beauty this orange ball was creating in the landscape. I ran upstairs in a hurry to tell Sonnia auntie and Shannan about the sunset without realizing that I was knocking on the wrong doors! Later when they came outside, the sun had already gone into hiding. After taking some pictures, I was interviewed by Shannan. During the interview, I talked about myself and confided my feelings about who I used to be and shared my dreams. The conversation made me realize that opening up to someone is not always easy. It is emotional, but once you do, it makes you feel light. The encouraging words they had for me were heartwarming. Like a mischievous child, I kept walking around the edges of high cliffs when I knew how much it scares Sonnia auntie. She didn’t want me to fall. 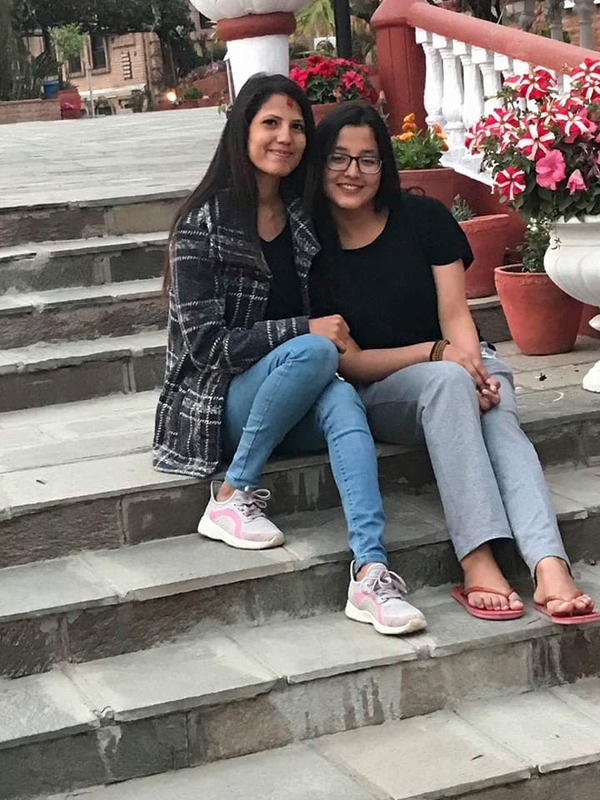 It warms my heart how much she loves me, and not only me but each of her Nepali daughters whose dreams makes her eyes twinkle and for whom she has dedicated so many years of her life. Mandira didi joined us later in the evening since she had to look after her sick brother, and her presence made the evening even more joyful. While Mandira didi did some catching up and was interviewed by Shannan, I was sitting on the couch curled up with Sonnia auntie and listening. It was every bit of a mother-daughter moment. 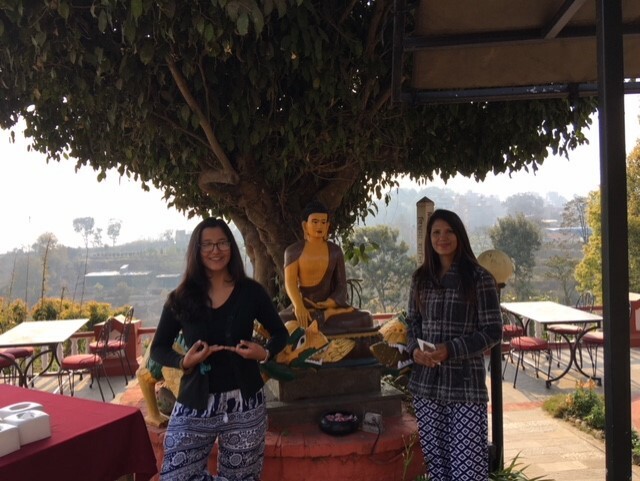 We ended the day with a delicious dinner, getting to know each other more, talking about travelling the world and life experiences, our bucket lists and a promise to meet at 5:00 the next morning to watch the sunrise—for which Dhulikhel is famous. 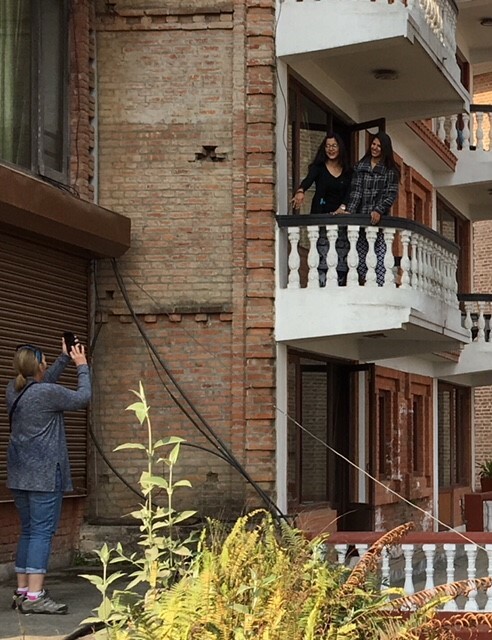 The next morning, we all gathered at the balcony where Sonnia auntie and Shannan were already waiting for us. 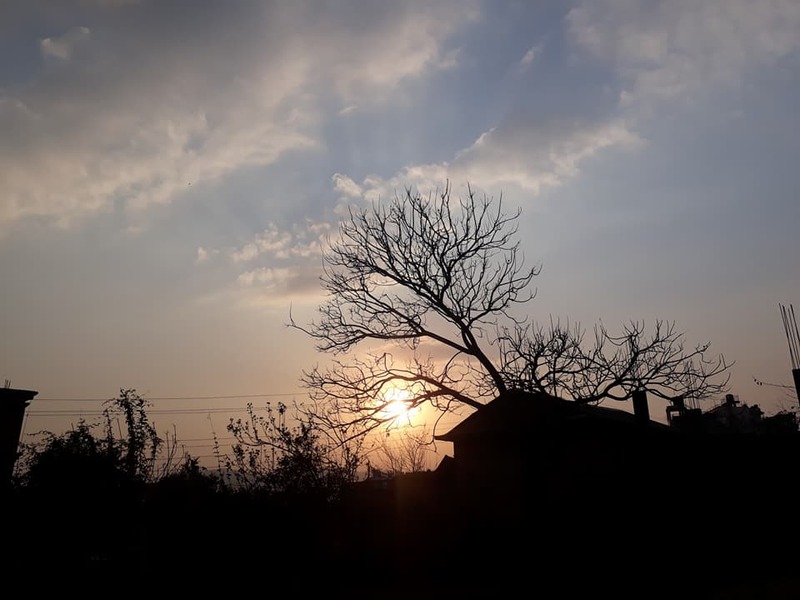 In the cold morning we were greeted by singing birds, playful pigeons who didn’t want to be captured on camera no matter how hard Sonnia auntie tried, and beautiful layers of mountains. Even though late, the sun finally showed up far in the sky like a red-hot air balloon painting the clouds in its morning glory. 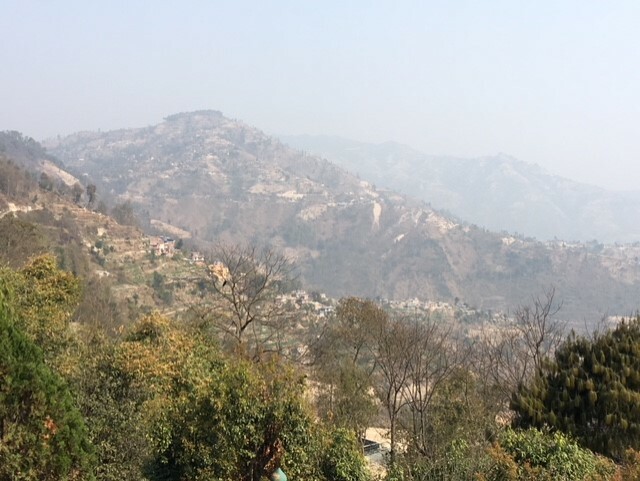 We were all in awe as we stared at the view with warm Masala chiya (Nepalese tea) under cozy blankets. 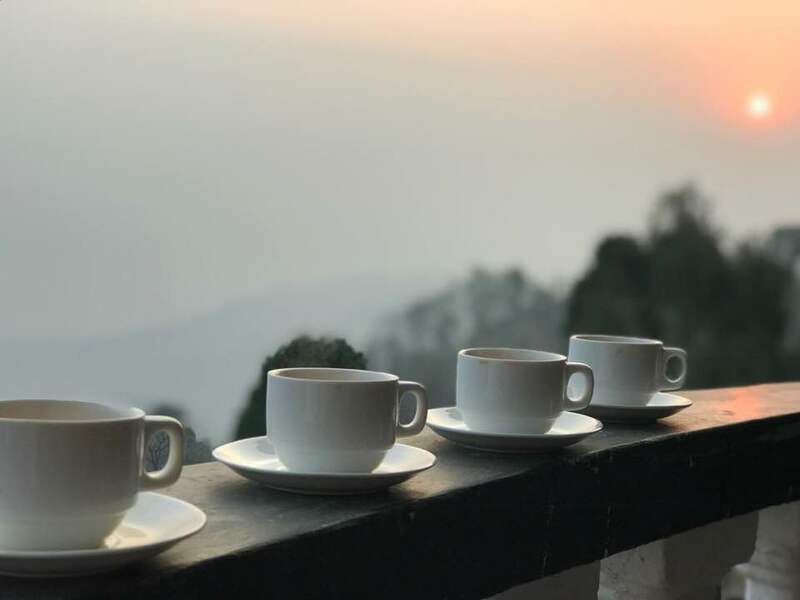 The morning sunrise view in Dhulikhel was every bit worth the wait and we felt elated. It was very funny hearing Sonnia auntie quote Shakespeare as she asked Shannan to take Romeo-Juliet pictures of Mandira didi and me standing in our balcony. But the funniest part was when I danced to the song ‘you are my Soniya’ and almost fell on my back. These are the memories I will never forget and treasure in my heart forever. With all the fun and giggles, I was dreading to say goodbye. I was the one who was telling Sonnia auntie earlier that day that, “we should never say goodbye because the right thing to say is see you later” but I couldn’t help but be saddened by the thought of not seeing them again. Because it doesn’t take weeks or months or years to be attached to someone, all it takes is a moment. Heading back home, I was talking much less in the car, because I was already missing the nurturing and kind personality of Shannan and mother figure Sonnia auntie. And when I reached home I realized it was not the Himalayan Horizon Hotel that was beautiful. The most beautiful thing on the horizon was the memories we created together there, the people we got to know and the nature that kept us company.